- The receiving of materials of the singers, who would like to take part at the XIVth International Music Festival Discovery 2005, concluded on 27th February 2005. The artists, who are approved for participating,will be anounced in the beginning of April on this website. 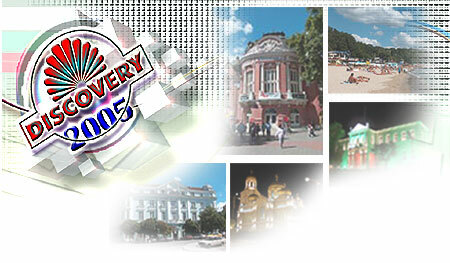 - The XIVth edition of the International Music Festival “Discovery” is planned to be held on 6th and 7th May in Varna. - The winner for Best Singer at the International Music Festival “Discovery 2004” Nico from Romania won the Grand Prix at the International Music Festival in Kazakhstan. - In August in Varna was shot the video of Michael Ro, who won the award of MSAT TV. The video of the song “Why” is already broadcasted by the Bulgarian media. The video was the award of the Romanian singer. - The winner in the Best Singer Contest Neda Karova from Bulgaria shot the video of the song “I have no tears”. The song was awarded second at the Best Song Contest from the International Jury of the International Music Festival “Discovery 2004”. The video was shot in the end of October in Varna.